First Novels Club: Are They The Same? 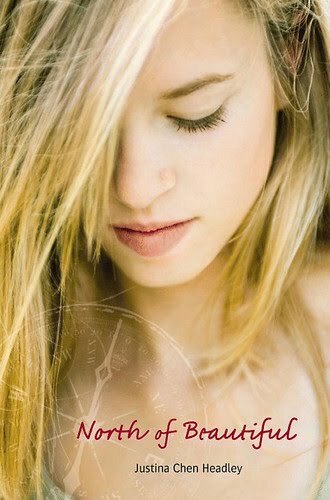 So I was stalking the YA section of Barnes and Noble (like you do) and gazing at all the pretty covers and drooling (like you do) and then I settled on the cover for North of Beautiful by Justina Chen Headley. Now most bloggers seem to know that this stock photo already appears in reverse on another uber popular novel, Evermore by Alyson Noel. 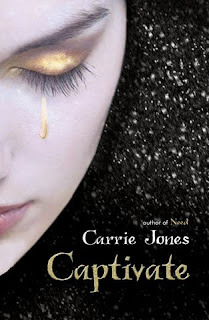 But...North of Beautiful was sitting right next to Captivate by Carrie Jones. Something about the shape of the eyelashes, eyebrows and lips struck me. In the bookstore it looked like they used a close up of the face and added the gold shadow and gold tear. But now online I'm not so sure, the shape of the face is a little off, but they may have shaved that and added in more black background. So what do you think? Are they the same? They really look to be similar. I can't tell if they're the same, though. I had never perceived that before! I think you're onto something there. What ever happened to art departments using original work? Not in the budget any more I guess. Using stock images is by no means cheap, but it's faster than doing photo shoots. I guess publishers are running pretty bare-bones design departments in this economy. I knew Evermore and North of Beautiful had the same picture but I'm not so sure about Captivate. Evermore and North of Beautiful are the same picture, but Captivate is a different one. The eyebrow is shaped a bit more upwards at the end. Interesting! I'm not sure if they're the same, but they might be. Laurel, it's definitely about money. It's pretty easy to manipulate pictures with Photoshop if you know what you're doing, and if you have a subscription to a stock image site, you only have to pay for it (and Photoshop) once. But with unique shoots you have to pay models, photographers, location fees, etc. It's much cheaper to go with stock images. I knew Evermore and North of Beautiful were the same, but didn't know about Captive. I think you're right! 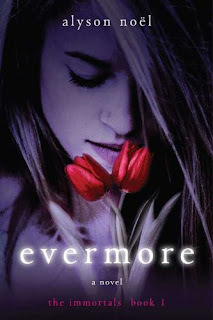 Wow, I have both North of Beautiful and Evermore, yet I never realized they were the same model. Guess I never thought about it either. I don't think so, I agree that the eyebrow shape just isn't the same. The mouth does look very similar (what you can see of it anyway). Never would've spotted that! Captivate DOES look a bit like the other two... maybe Photoshop is the culprit. Who knows? I wonder if you could ask the publisher or something! Very interesting...they look pretty similar to me! Wow. I can't believe I never noticed that before.